Journalist and suburban mom Claire Cooper suffers from panic disorder. Most of her anxieties seem irrational, nothing that can't be fixed with the help of some Xanax. But late one stormy summer night, when her husband, Sam, is away on one of his frequent business trips, Claire's fears come to life. She discovers an intruder has broken into her young daughter's bedroom. She watches helplessly as he picks up her sleeping child from her bed. Desperate to protect her family, Claire puts herself in the line of fire and utters the plea that will undo her: "Take me instead." As she drives away in the kidnapper's car, Claire fears for her children, but not for herself. And she can't help noticing the reversal in her marriage -- for the first time in ten years, Sam will not know where she is. For the next week, Claire is tied to a bed in a strange motel room, the intruder her only com-panion. She is forced to lie still and contemplate the reasons for this assault on her family. Is this just a random crime, or something more sinister? Has the shadowy past that she tried so hard to leave behind finally caught up with her? Day after day, she goes deeper into herself, reevaluating her marriage and her role as a mother, and unburying the source of her crippling anxiety. In seven days she will step out to the very brink of her soul -- perhaps never to return. 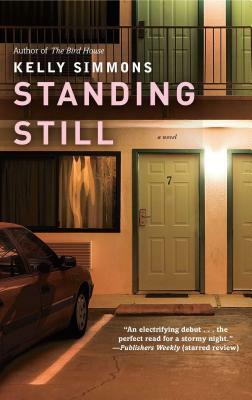 A riveting debut novel that will appeal to fans of Sue Miller and Janet Fitch, Standing Still is a powerful exploration of the darker side of mother-hood and marriage. Kelly Simmons is a former journalist and advertising creative director specializing in marketing to women. She lives with her family outside Philadelphia. Please visit her website at ByKellySimmons.com.